Do you want to increase your search rankings? Did you know your Google+ page and profile could help? Google+ can help you increase search rankings for your website, but you have to take the time to optimize your page, profile and content. This article shows you three ways you can maximize your Google+ presence and tells you why that’s important for SEO. Google+ isn’t just another social media platform; it’s a powerful weapon in your SEO arsenal. Check out Moz’s recent Future of Search Report for the latest on ranking factors. SEO ranking correlations. Image source: The Future of Search: 2013 Search Engine Ranking Factors Released, by Moz. Editor’s Note: This article has been edited as there’s been a change and the links on the About tab of Google+ Page and Profile are no longer DoFollow links. The reason Google+ is an SEO goldmine is that the first link added to a Google+ page post is a DoFollow link, which means it passes link equity, or link juice, on to the website you share. If you’re sharing your website, you’re getting the link juice. DoFollow links are a core building block of SEO. They work in conjunction with PageRank, TrustRank and link context to determine how you rank for specific keywords. Spending a little time to optimize your information can reap big rewards. With five easy tweaks to your Google+ business page and personal profile, you can build a strong foundation for SEO success. The SEO title is the name of your Google+ business page (be sure you’re using your company name here). Avoid trying to stuff any keywords into the SEO title—it’s unprofessional and has little SEO value. Google+ recently rolled out the Custom URL feature. This is great news for companies that want to include cleaner links in their marketing. Your new customized URL looks like this: https://plus.google.com/+YourCompanyName. 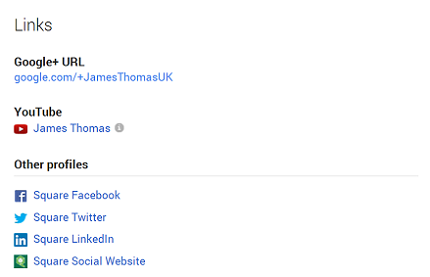 Below you can see where I’ve customized the URL for my personal Google+ page to JamesThomasUK. The SEO meta description for your page combines your tagline and the first two sentences of your introduction. You only get 160 characters, so make them count. Click the Manage This Page button at the top of the page. Click Edit Page on the section with your page name on it. Click Edit in the Story section on the next page. It’s smart to include one or two of your target SEO keywords in your description. Google+ authorship is an important ranking factor and one that you may not know about. Authorship tags each piece of content you create and lets Google know you created it. If you have an email address that matches your domain (i.e., john@yourURL.com), you can go to the Google+ Authorship page and simply enter your email address to complete the process. If you need more help, Google has provided a more detailed guide in the Support section of Google Webmaster Tools. The image below shows what a correct Google+ authorship looks like. You can see that my picture and Google+ information are included next to my name. Google+ authorship information as it appears in search engine results. Once you’ve optimized your Google+ page and profile and correctly set up authorship, you’re ready to start posting content. This is the quickest and easiest way to build a solid following on Google+ because at the end of the day, content is still king. 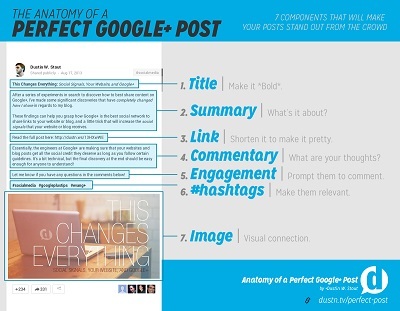 The Anatomy of A Perfect Google+ Post. Image source: Dustn.tv. Share a summary of the content you’re linking to. Don’t go overboard; short and simple are fine. Don’t include the link in the Summary box. Instead, put the link in the Link Attachment area so you’ll get the SEO benefit of a DoFollow link. Share the content with any of your existing circles. 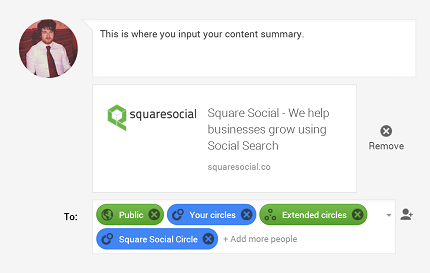 Check the box that allows you to email your Google+ update to your circles, if you think this is something a specific Circle in your audience would like. Now it’s time to pull all of your efforts together and start tracking your results. You cantrack every piece of Google+ content you distribute or just a chosen few. Tracking the content you share on Google+ allows you to correlate SEO gains and ranking increases against Google +1s and other social signals. An easy way to keep an eye on what’s working and what’s not is to assign each Google+ link a custom URL, then review its stats weekly in Google Analytics. Website URL: Enter the URL of the content you want to share and measure. Campaign Source: This is the platform you’re using to distribute the content—in this case, Google+. Campaign Medium: The medium is how you’re sharing your content. This could be a tweet, Facebook status or LinkedIn update. In this instance, the campaign medium is Google+ Post. Campaign Term: You can skip this one for now. It’s not used for this campaign. When you’ve completed the URL Builder form, click Submit and you’ll get your appended URL. If you like, you can use a URL shortener like bit.ly to make it look cleaner. Use Google+ to increase your SEO ranking. With so many changes in the Google search algorithm, it’s important to keep up with what matters—and right now, Google+ matters. Taking the time to optimize your page and profile, share interesting content and track your efforts puts you on the path to higher SEO rankings. What do you think? Have you seen value from your company’s Google+ page? Share your experience in the comments! If you want to increase Google ranking, you need to take G+ seriously for some obvious reason -- it's Google's social media platform.